Remember the Boxed Brownies vs. Homemade Brownies experiment I did? And the Boxed Mac and Cheese vs. Homemade Creamy Mac and Cheese experiment I did? How about my Sunday Dinner Challenge, which took a whopping one minute, forty eight point nine seconds to make? My boys love that I keep making them bring the stop watch into the kitchen for these “races”. It’s that male competition thing they have going on. From the time I opened the boxes, to the time I put the muffin pans into the oven, 6.25 minutes had passed. 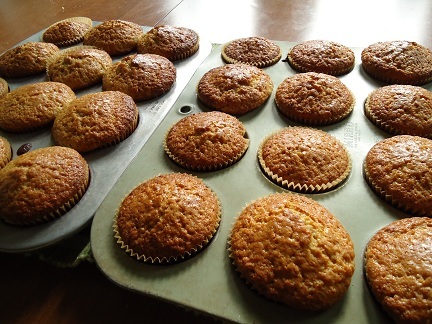 A few weeks later, I mixed up my Applesauce Bread recipe and made the batter into muffins. How long did it take? Right at 7 minutes. And these had whole wheat flour, honey, and real, unsweetened applesauce in them. Nutrients! For my family for breakfast! What a concept. This, because I spent about 45 seconds longer making muffins from scratch. Shredded carrot would probably be awesome in those muffins. Maybe some macadamias/ flax seeds? :O Drizzle of dark chocolate… Switch out the applesauce for pureed pumpkin. O.o Swoons- – serve hot w/ cream cheese. Nom. 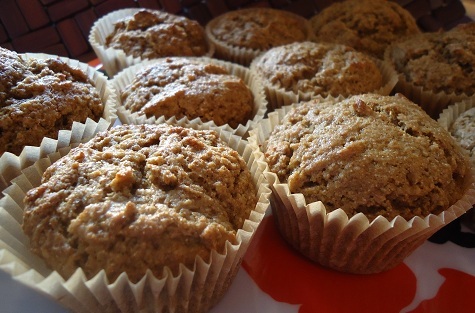 I found an amazing muffin recipe a while back (which I tweaked to be healthier- thank you Laura for teaching us that!) that starts with the basic batter, then you add what you want. I usually use it to do blueberry muffins, but have added diced apples and cinnamon, banana, plain cinnamon, peaches, pears, pumpkin, pretty much whatever fruit I have handy at the time. And it takes no time to make and costs less to make waaay more than the boxed recipe. Which is good in a family of 6! The only thing I haven’t gotten in the habit of making from scratch yet is bread/buns, and I hate to admit this- spaghetti sauce. So the spaghetti sauce is my next goal, cause $5 a jar for organic is a little much to pay! Could you post your muffin recipe? sharing the recipe with us all? I think she just used the apple bread recipe (referred to in the article) and modified to make muffins. Love! Do you ever premix your muffin mix, freeze it and then just add the liquids? I’ve been thinking of doing that. Anyway, I have had to go gluten free for a while and I’m a little lost so once I figure out a GF mix, I am all there! 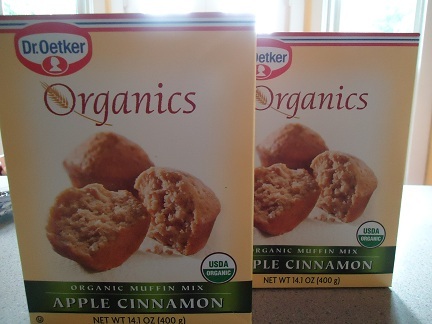 How do you adjust the time/temperature on your applesauce bread to make applesauce muffins? I bake them at 400 for 20 minutes. Thank you, I was wondering this too! I already make this, but it might be worth it to show others… Homemade tomato soup. Yours even look better. I am going to make those muffins next week. This week we are eating your pumpkin muffins. Yum! Do you do bread from scratch? I was thinking homemade pudding. The cook n’ serve versus a from scratch version. Never did understand why someone would ever buy a muffin mix. The ingredients are always scary and the “fruit” often comes from artificial flavor. What good is a “fast” boxed mix if the quality is sub par? I’d much rather spend the extra time to achieve a superior finished product. I just got a windfall of fresh pears from my friend and am planning to make pear, ginger and walnut muffins, yum! I think I’ll make 1 tin as mini muffins to freeze for my daughter’s school lunch. As for ideas to try…how about pancakes. As long as you choose a boxed mix that calls for egg, milk and oil, it would be a fair fight, since you would have to bring the egg and milk to room temperature for use with coconut oil in both recipes. I think you might lose on waffles, since you have to beat the egg whites to stiff peaks and fold them into the batter. I have a Belgium waffle iron as we did growing up. My Mom always swore that folding in the egg whites at the end led to a lighter waffle. I think the extra lift is especially needed when using white whole wheat flour. Though I’m a foodie and a perfectionist to boot, so I’m not one to skimp on extra steps when it comes to food :) Last night, I spent 45 minutes making eggs (fried potatoes and smoothies)! Well ok, it was a veggie scramble (zucchini, spinach, onion, tomato and munster cheese). I had to rinse and chop everything. Sautee the zuchinni, onion and spinach, grate the cheese, cook the potatoes and onions, make the smoothies and cook the eggs. Sure I could have made regular scrambled eggs, but this was so much healthier and tastier. Sadly, I spend WAY too much time in the kitchen, since I refuse to settle for mediocre food. Oh, I thought of another challenge. Homemade (vinaigrette) pasta salad vs Suddenly Salad or some other boxed pasta salad. I’ve seen a lot of Suddenly Salad adds lately and it really irks me because homemade pasta salad is such an easy thing to make, even with homemade Italian vinaigrette. I can’t fathom why people make muffins or pancakes from a box homemade are so much tastier and so easy. we do pancakes once or twice a week.It takes no time at all and lasts so much longer than cereal, especially when you sub syrup for cream cheese and homemade jam.